The weblog tool, developed by Traction Software Incorporated, works like an interactive Web newspaper. Information is labeled and categorized by subject or by posting time. U.S. Defense Department tests Web technology for program management tasks. The Office of Naval Research and the Naval Undersea Warfare Center are testing a commercial Web technology that will boost network centricity in the program management process. 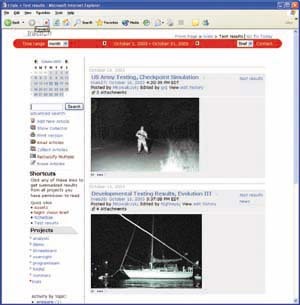 An enterprise weblog, a Web-based journal that supports information sharing, communication and collaboration all in one medium, is being employed during the test and evaluation phase of a night-vision technology project. One of four pilot programs funded this March by the U.S. Defense Department’s Rapid Acquisition Incentive–Net Centricity (RAI-NC) initiative, the weblog implementation project will accelerate transformation and new technologies to the warfighter by increasing analysis-sharing between program managers and stakeholders. Traction Software Incorporated, headquartered in Providence, Rhode Island, developed the weblog used in the pilot program. Founded in 1996, the company creates hypertext journaling systems that organizations use for information management. Commercial businesses began to use the weblog as a research, marketing and competitive intelligence tool. In 2000, In-Q-Tel became an investor in Traction. In-Q-Tel is a Central Intelligence Agency-funded nonprofit company that supports technologies that may benefit the U.S. government. One of the organizations that has implemented the weblog technology is the Naval Undersea Warfare Center (NUWC) in Newport, Rhode Island. Tammi McVay, program analyst project lead, NUWC, recalls using the weblog as a knowledge management solution. 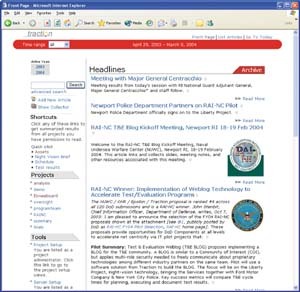 It was not until the 2001 Naval-Industry Research and Development Partnership Conference that the idea to use the weblog in program management began to take form. Thomas Kowalczyk, founder and manager, KMRM LLC, who also does contract work for the Office of Naval Research, had collaborated with McVay in the past. At the conference, Kowalczyk and McVay made a deal with the Ford Motor Company to test the night-vision technology without any licensing fees. Called the Liberty Project, the arrangement involved having a variety of organizations such as the U.S. Army Night Vision Lab, the U.S. Marine Corps, and the Newport and New York police and fire departments test the laser diode illuminator night-vision technology within their organizations and report the results. According to Greg Lloyd, president and co-founder of Traction, the weblog is designed for “groups with a goal” and provides a project space to organize, disseminate and exchange information through and across private access spaces. An authorized user, such as a program manager or contractor, can post e-mail, test analysis documents and Web pages to the weblog. These items can be loaded to the site in near-real time either by sending them through e-mail, filling out a form on the weblog or using a software program for Microsoft Windows clients called Instant Publisher, another Traction product. To add a document to the weblog, it is dragged and dropped onto the Instant Publisher icon on the desktop. Once the information is uploaded, an e-mail is generated automatically to alert a program manager of a new post. Another automatically generated e-mail, the executive summary e-mail digest, collects the headline and first paragraph of each new post made throughout the day and sends them to users in a newsletter format. The headlines are linked to the actual post, which enables viewers to click on the link and access the full article on the weblog. Another feature of the weblog allows users to have a live news feed that is linked to the weblog delivered to their desktops. Called the rich site summary, or really simple syndication, a constant stream of the headlines from weblog additions or changes runs across the desktop screen. The program manager can click on the news item to be taken directly to the item on the weblog. These features not only transform program management from a push method to a subscribe-and-publish method, but they also increase situational awareness by providing the most up-to-date program information at all times. Labels categorize weblog items by subject or by post time to allow users easy navigation. Users can attach comments, questions or problems to postings, allowing others to respond. This facilitates problem solving and interaction among different organizations as well as supports network centricity, Lloyd says. By sending items to and from one central information source, the weblog eliminates the overload of e-mail and reduces information redundancy, alleviating network clogging. In addition, providing information to the weblog only once reduces the potential for error in transmitting information. Liberty Project team members post their test results, including photographs, documents and links to other Web pages on the weblog so the program manager and other partners testing the laser diode illuminator can evaluate the entire program at any time. The weblog also supports information security because it can be partitioned into various levels of program access. According to Lloyd, contractors can have read-and-write access to their contract space and can interact with other contractors without even knowing that the internal program management space exists. Program managers can view the entire site and can write, edit or delete information in all categories. If information is edited, the item will be labeled showing who made the change and when the change was made. While items can be deleted from the program space, such actions are recorded to show what has been deleted. As a result, a complete audit trail of the program is created. Because the weblog software is housed on the program management office’s server, organizations can use their own public key infrastructure configurations for added security. Liberty Project team members employing the weblog say they find it easy to use, shares Kowalczyk’s son Matthew, who is a systems engineer for Epsilon Systems Solutions Incorporated. He has the dual task of designing a working system of the laser diode illuminator for each participating organization and ensuring that each test group understands the weblog technology so that it can post test results. He maintains that the technology is as intuitive as the Internet and can be learned in as little as one to two hours. Because the weblog implementation project is still in its initial phase, McVay could not comment on how well it works as a program management tool. But she cites how useful it is from an organizational standpoint. “I cannot overstate the usefulness of this weblog. You can have the program charter, project plan, spending plan, statements of work and meeting briefings all posted on the weblog.” McVay also notes that the ability to post all e-mail to the weblog reduces the amount of messages in her inbox and better organizes the information within the e-mail. Analysis of the weblog will continue after the RAI-NC pilot project ends its four-month trial. The Defense Department program office will conduct a wrap-up phase with additional analysis to determine whether the weblog is a tool that should be available to all program managers. The Defense Acquisition University also is involved in the pilot to potentially implement the weblog tool and process into its program management curriculum. McVay hopes the pilot program can deliver a use case and best practice guide for program managers in the Defense Department. 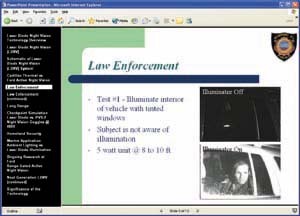 A PowerPoint presentation on the Liberty Project weblog gives an overview of the technology, including sample tests, from the Newport Police Department in Rhode Island.